One of my favourite things about The Big Sick, a romantic comedy with deep dramatic undertones that reinvigorates the well-worn genre, is how little moments from the film keep coming back to me a week after seeing it. This is a wonderful film on so many levels, at once delivering a moving portrait of an unlikely relationship being put through the ultimate endurance test, a touching look at someone getting to know their partner’s parents, as well as a bittersweet study of the cultural push and pull between different traditions that many immigrants face. The film is based on Kumail Nanjiani’s real life relationship with his wife Emily V. Gordon, and they co-wrote the deeply personal screenplay together. Kumail Nanjiani plays a version of himself, and when we first meet him in The Big Sick, he is a struggling standup comic who meets the bright young Emily (Zoe Kazan) at one of his shows, and starts going out with her after a one night stand. But their burgeoning relationship faces some major hurdles. Being a Pakistani immigrant, Kumail’s parents (Anupam Kher and Zenobia Shroff) expect him to take part in a traditional arranged marriage, bringing in a seemingly endless cycle of young Pakistani women to meet with him, and he has to keep his relationship with the American Emily a secret lest they disown him for dating outside his culture. Things become even more complicated when a huge fight causes them to part ways, and Emily contracts a serious illness that lands her in the hospital, where she is put into a medically induced coma. This brings her parents (Ray Romano and Holly Hunter) to come stay with her, and Kumail starts to bond with them as he makes the choice to stay by their daughter’s side, waiting for her to wake up and hopefully rekindle their relationship. There is a sense of raw emotion channelled throughout The Big Sick that makes the film feel identifiably real, both in its dramatic and comedic moments. The film is unique for a romance in that for much of its running time the love interest is in a coma, and the story ends up being just as much about someone getting to know and bonding with their girlfriend’s parents, as it is about the relationship between two individual people. This is one of the aspects that makes The Big Sick feel fresh and different, and the other is the way that it explores Kumail’s struggle to balance his want to embrace American culture, with his parent’s desire for him to follow Pakistani traditions and not stray from his Muslim faith. The film explores this convergence between two cultures that a lot of immigrants face, as well as the struggle to balance secularism and religious traditionalism, in a really moving and honest way. This leads to a heart wrenching near-climactic confrontation between Kumail and his parents that provides one of the film’s best and most powerful scenes. 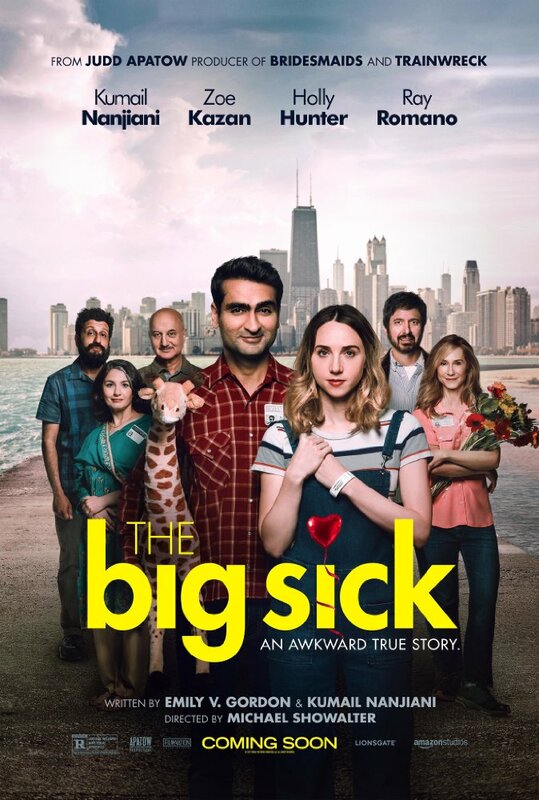 These are incredibly complex and not to mention timely themes that feel brave for any movie to broach, let alone a romantic comedy, and The Big Sick explores them with an eloquence and sympathy for all involved that I found to be rather moving. Directed by Michael Showalter, working closely with producer Judd Apatow who helped get the film off the ground and whose stamp is felt upon the finished project, The Big Sick falls into a natural rhythm that allows the cast members to play off each other in a lot of delightful ways. Kumail Nanjiani does a fine job of carrying the film, propelling himself to leading man status as he effortlessly delivers both perfectly timed one-liners and affecting dramatic moments. Ray Romano and Holly Hunter are big standouts of the supporting cast, displaying both a natural and affable charm, as well as the pain of being put through the emotional wringer of having to fear for their daughter’s life. This is one of those films that walks the tightrope between comedy and drama, between eliciting laughs and getting us choked up. It’s a film that take us on an emotional ride, and allow us to spend time with and get to know the characters. Put simply, I enjoyed being wrapped up in the warm embrace of The Big Sick for two hours. I enjoyed spending time with these people and becoming invested in their lives, and I found myself having fond memories of the experience afterwards.